Stonemaier Games has unveiled a new expansion for its wine cultivating game Viticulture, which focuses more on experiencing the wine business than actually winning the game. 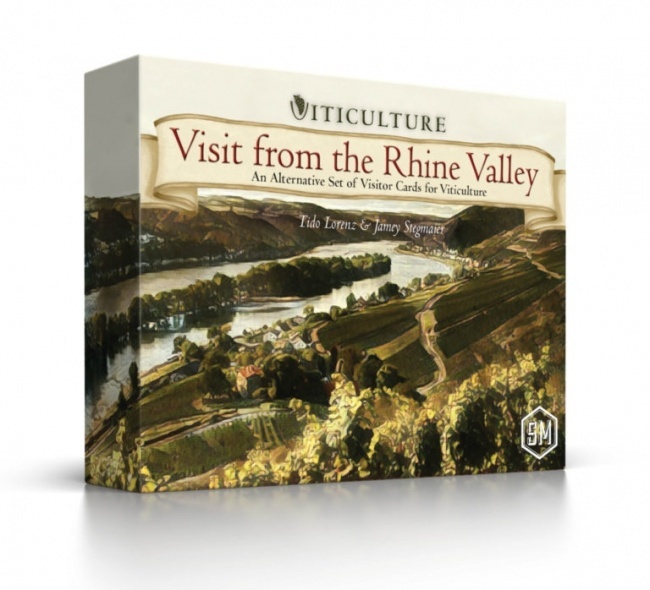 Visit from the Rhine Valley is designed by Tido Lorenz (Fields of Arle: Tea & Trade), with oversite and input by game designer Jamey Stegmaier. The expansion introduces 80 new visitor cards, 40 summer visitor cards, and 40 winter visitor cards, for players who wish to revel in the wine business experience, rather than gaining victory points to win. The cards have unique backs, so they must be played without other visitor cards from Viticulture, Tuscany, and Moor visitors. Four of the cards can only be used with the Tuscany expansion, and 6 of the cards are the same as existing cards (banker, contractor, craftsman, harvest expert, zymologist, and uncertified oenologist). Release is planned for June 1, MSRP is $20.00. Viticulture was an indie hit for Stonemaier, released several years before its runaway hit Scythe (see �'Tuscany' Expansion, 'Viticulture' Shipping to Trade�). The company will also be releasing a new expansion later this year for Scythe (see �Final 'Scythe' Expansion�).